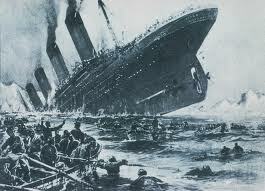 Early in the morning of 15th April 1912, the unthinkable happened to the unsinkable, it sank. The maiden voyage of the White Star Lines Fleet ship “Titanic” was forebode as a disaster even before this trip. Everyone knows more or less the story of the sinking, so I am taking a different tack on its origins, construction, associations and sinister rumors, which abound regarding the lesser-known aspects of the White Stars 3 Olympic class ships. In 1907 a discussion was had between two very successful J’s, the White Star Lines chairman J. Bruce Ismay and the American financier J. Pierpont Morgan. Ismays Company was owned by Pierponts Mother Company and as result both were losing out to the faster passenger ships of the Cunard line, notably the Lusitania (my grand uncle actually went down with this ship in 1915). Instead of trying to compete for speed they changed the playing field and opted for size. Three ships were to be constructed in a new Olympic size class, which would offer the most sumptuous luxury crossing of the Atlantic to those who could afford it. This tender went out to the Belfast shipbuilding firm of Harland & Wolff who had been building ships since 1861. No expense was to be spared in the most innovative construction and fittings; 3 million pounds sterling was allocated for the first two of the three vessels. Everything about the magnitude of these ships was innovative, the two slips to release them had to be specifically made from three regular slips. They all employed a combination of reciprocating engines with a centre low-pressure turbine, as opposed to the steam turbines used on the Cunard vessels. 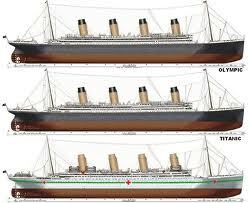 The Olympic ship was the lead ship of this triumvirate and construction began three months earlier than the Titanic to accommodate the pressure the shipyards would be under from such an order. It was hull no. 400 built by Harland & Wolff. She was launched on October 20th 1910 with an id no.131346. Her maiden voyage began on June 14th 1911 at which time she was the largest ocean liner in the world. Her first mishap occurred on September 20th of the same year when she collided with the British warship HMS Hawke off the Isle of Wight causing two of her compartments to flood (a bleak forewarning perhaps). At the time the ship was under the command of Captain Edward Smith, one of the most experienced seafaring men in the world. He later transferred to the Titanic. Violet Jessop was also on board as a stewardess. The Olympic had an illustrious career being the scene of mutiny in 1912 and the only merchant ship to engage and sink a German U Boat during WW1. Being identical to the Titanic it attracted many passengers to sail as a way of vicariously experiencing the voyage of its ill-fated sister ship until it was finally scrapped in 1937. The Titanic ship was the second ship to be completed albeit a little later than originally planned (due to the mishaps of the Olympic). It was yard no. 401. She was launched on May 31st 1911 with an id no. 131428. The mythical id no 3909 0N never existed (NO POPE backwards). Her maiden voyage began on April 10th 1912 at which time she became the largest ocean liner in the world. It sailed out of Southampton (England) to Cherbourg (France), to Cobh (Ireland) with its final destination being New York (USA). Her mishaps were numerous prior to this maiden voyage. During construction, 6 workers died, 246 injuries were recorded, and 28 of them “severe”, such as severed limbs. On the launch day a piece of wood fell from the ship and killed a worker. There was a near collision with the docked S.S New York as the suction snapped the tie ropes from its mooring. Tugboats acted quickly to avert any danger. It is ironic that it never reached either the ship New York or the port of New York. She sank when five of her sixteen watertight compartments flooded when they were ripped asunder by a glancing iceberg (4 and it would have stayed afloat). There have been some suggestions that if the other compartments had been opened it would have staggered the listing rather than let the water flood in from the top. The Titanic had the capacity to carry 64 wooden lifeboats with a capacity for 4000 occupants but the White Star Line decided that 14 lifeboats (65 people) and 4 collapsibles (47 people) and 2 cutters (40 people) would suffice (accommodating 1178 people). Board of Trade regulations stipulated that all vessels over 10,000 tons had to carry 16 lifeboats with a capacity for 990 occupants. Out of the 2, 224 people on board only 710 survived partly due to the lifeboats being launched only partially full. Those that foundered in the water were not due to a lack of lifejackets but rather hypothermia. The captain of the Titanic Edward Smith went down with his ship. Violet Jessop was on board as a stewardess and survived. The Britannic ship was the final Olympic class liner to be built, partly due to cost, WW1 and new safety improvements being implemented as a result of the Titanic sinking. She was launched in February 26th 1914 but never got to make her maiden voyage as a luxury liner. WW1 interrupted her fitting and she was requisitioned on 13 November 1915 as a hospital ship from her storage location at Belfast. Repainted white with large red crosses and a horizontal green stripe, she was renamed HMHS (His Majesty’s Hospital Ship) and armed with four anti torpedo guns. After completing five successful voyages to and from the Middle East transporting the sick and wounded. The Britannica was steaming at full speed into the Kea channel with 1066 people on board when it was hit by a torpedo on November 21st 1916 taking only 30 lives. It was the largest ship lost during WW1. Violet Jessop was on board as a nurse and survived. Ships are referred to in the feminine because they are traditionally the name of the boat’s owner loved one (wife, daughter, mother). It has also been surmised that all ships were once dedicated to goddesses. If they were still dedicated to the female deities they may not have sunk, perhaps Violet would have been a lucky name. Interestingly enough none of the three vessels were ever christened. Whether the new or old Gods were displeased with the White Star Line or a mixture of arrogance and inadequacy were the cause of the failure of the first Olympic class liners we will always surmise but never really know. One thing is for sure you cannot avoid your fate, whatever it may be.